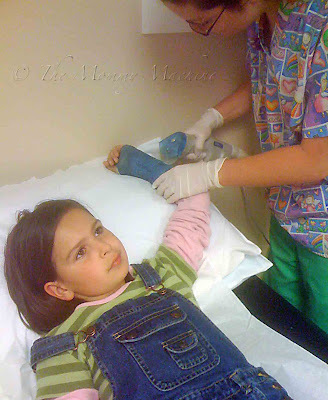 A couple of months ago, my 9-year-old daughter broke and displaced both bones just above her left wrist. I'd advise against your children trying it. My sister-in-law is a wonderful cook, a chef really, and over the years she has educated me on a variety of topics, including but certainly not limited to: tomatoes, which should not be refrigerated but rather left on (a) their vine and (b) the counter to ripen; cous cous, which is not as exotic as it sounds and quite easy to make; fudge, as in her recipe is the most delectable I have tasted in all my vast experience of consuming fudge and fudge products—I know, I know, you think you or someone you know has a better tasting fudge, and I'm not here to argue with you, but . . . Chris Gahman makes the best fudge in the entire world, bar none; tea—how to select the real stuff and then make a good cup; the many uses of pizza stones; and the importance of baking on high-quality cookie sheets. A multitude of interesting cookbooks sit on Chris' shelf, and perhaps 10 or more years ago, I remember selecting Once-a-Month Cooking from her kitchen library to read. 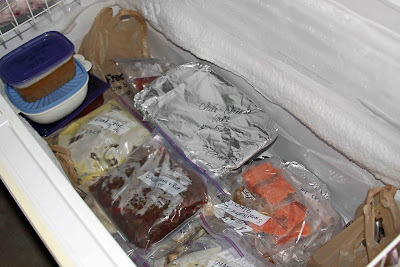 While I never followed its system as outlined, I have used a version of its philosophy, which is basically to cook meals in batches and then freeze them for later consumption. I've mentioned some of my practices here and here. 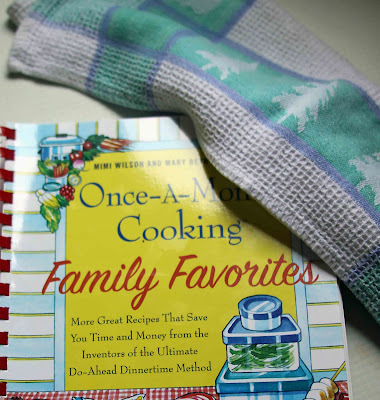 The other day, I happened upon the original book's updated version, Once-a-Month Cooking Family Favorites. I bought it. I read it. I pondered. I made a decision. I was going to try the method exactly as directed. 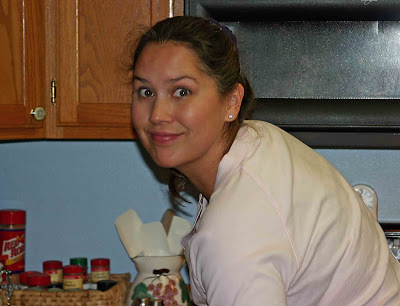 I talked it over with my husband to make sure he was on board, because he would have to watch over the children all day so that I could hang out in the kitchen. He agreed, and this past weekend I set out on my cooking adventure. 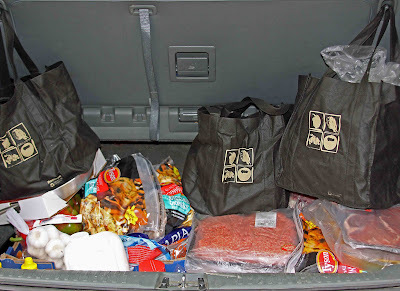 As suggested, I shopped for groceries the day before cooking. The book provides a shopping list, divided in categories (bakery, frozen, canned, meat, etc. ), so my trip was focused and simple. It took me about two hours, because I chose to visit two stores (Sam's Club and my local market). Then I spent all day Saturday cooking. The first three hours were spent in prep: rinsing, peeling, chopping, etc. If I do this again, I will definitely stop after the prep and call it a day. Once you've got all your prep work done, you go into assembly line mode and begin preparing each dish. For example, you start with a big batch of meat sauce, some of which you'll save for spaghetti and the rest you'll use to smother stuffed shells. The day was horribly, exhaustingly L—O—N—G and next time I will break it up into three parts: Day 1 Shopping, Day 2 Prep, and Day 3 Assembly. You have to go through the process once to know how to adapt it to your needs, so I kept a pencil by the cookbook to jot notes and reminders into the margins as I went along. Some of the recipes provide only 4 servings, so I'll want to double those next time. I could have used fresh mushrooms instead of canned. There was no need to chop an entire head of cabbage since it won't get used until the minestrone is actually served. I will pay one of my kids to wash dishes while I'm cooking, because I ran through every mixing bowl, measuring cup, and cooking utensil that I own several times over and had to keep stopping to rinse out my finite number of skillets. The upside is that my freezer is full of 30 meals. THIRTY meals, people! One day of pain in exchange for a month of meals is the type of discomfort that I can handle. 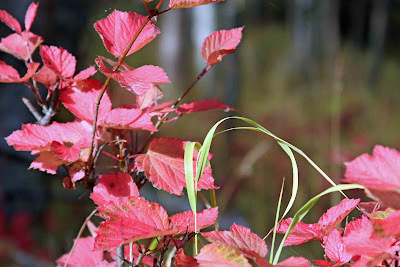 We are in the middle of a colorful autumn, as the gold and orange and brilliant red leaves will attest. I must admit that fall is my favorite time of year. It's cool, but not cold. Certain flowers are still in bloom and potatoes can still be dug up. The birds are starting to leave, so we're treated to awesome sights in the sky, as families of swans and large Vs of geese head south. The trees are absolutely gorgeous. But Time waits for no man. That light powder that just showed up on the mountain tops? Not good. Winter's coming . . . soon. All of the sudden, it's Moose Central around here. A momma and her yearling are running around behind our house. A mother with two calves is hanging out in the front yard of our neighbor down the road. And a certain antisocial skinny-legged twig eater has been lurking in the woods that border our local elementary school. He leaves the kids alone, but he's a little creepy standing off by himself . . . chomping . . . and watching . 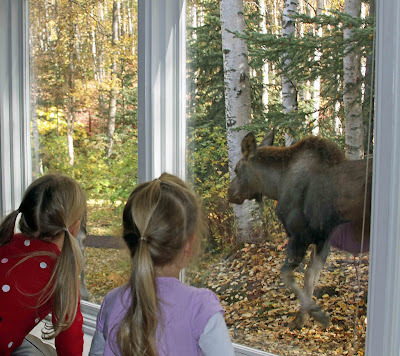 . .
No, we're not interested in fresh moose nuggets. Go offer your wares somewhere else! Bleh. My back started to go out, then I caught some kind of gross stomach bug that knocked me for a 24-hour loop, which led to my back seizing up on me after laying in bed all day trying not to hurl. Even if my back would have allowed me to sit in front of the computer, my 9-year-old needed it for her research project. RESEARCH project. 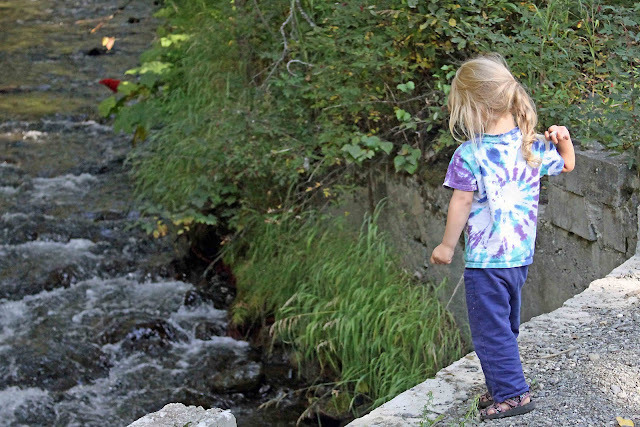 She's in fourth grade and knows nothing about introductory paragraphs, conclusions, or thesis statements, but she's supposed to write two papers—yes, TWO—on mountains and lakes. So I was gasping in pain, while trying to teach her how to take notes and write paragraphs and put everything together in a RESEARCH PAPER, and she was Googling phrases like What is a mountain? and How are lakes formed? while her mother was not blogging. Speaking of not blogging, I'm feeling discouraged. I'm not sure why. Can't put my finger on it. I want to write more. I want to write less. I want to change my focus. I want things to stay the same. I can write. I'm illiterate. Who cares who reads my stuff—it's nonsense, anyway. Why can't I attract an audience? You see my dilemma. 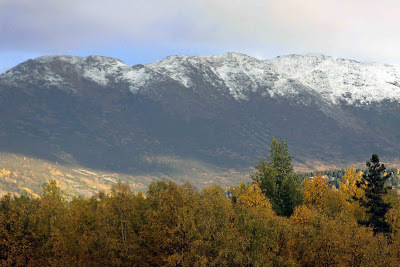 Somebody forgot to tell Alaska that the first day of autumn doesn't arrive until Tuesday. Guess who'll be sweeping her deck this weekend? I love when the leaves turn gold. And the reds! Aren't fall colors gorgeous?! Time to haul out the harvest decorations. I've got a scarecrow with a WELCOME sign to hang on my front door and a mat in the shape of a pumpkin to lay down for guests with muddy shoes. It's fall, ya'll. My sisters-in-law told me a story of how they spent 8 hours together at Nordstrom. Theirs wasn't a tale of horror. No, no. They were proud of themselves. In fact, that was one of the happiest and most glorious times of their lives, shopping and lunching and shopping . . . for an entire day. I, on the other hand, consider 8 hours trapped in a department store the worst kind of torture. Forget about waterboarding. Take those Gitmo prisoners and send them into Nordstrom without any money, and I guarantee you they'll come out after 8 hours begging for a map so they can show you the exact coordinates of Osama bin Laden's cave. Anything to keep them from going back in to face the skinny ladies behind the counters, dressed in black with their perfect makeup and manicured fingers. You want to know where weapons of mass destruction are hidden? Take a terrorist to the area in front of the brightly-lit dressing rooms, where fashionably-dressed customers hold their armfuls of designer clothing with ease and confidence, like there's nothing at all uncomfortable or horrifying about the fact that they're waiting in line to get naked in front of mirrors. Stuff that suicide bomber's pasty white body into a pair of trendy jeans that hits him so low on the waist his muffin top looks more like a super-sized bagel, and then make him come out in front of everybody to use the full-length 3-angle mirror. You'll get your information. I recently went shopping for shoes. They're the one item I can't order online, because sizes and styles vary too much. The beautiful high-heeled pump with a satin bow pictured on my monitor ends up looking like a witch's shoe on my foot, all pointy and pinchy and wobbly. The hard, cold reality is that I have to go inside the walls of a store and actually try on footwear. It still involves mirrors, but at least I don't have to take off my pants. I started out my adulthood with size 8 feet. Not bad for a 5'10 body. After my first pregnancy, I moved up to 8-1/2. After my second pregnancy, I had to start wearing size 9 shoes. After carrying twins, I began buying size 12E. Okay, maybe I'm exaggerating, but while pregnant with the twins, I actually did have to purchase a couple of size 10 slip-ons. I was so heavy, I guess, that my feet flattened out. Since giving birth to the girls three years ago, I've gone back to wearing all of my size 9 shoes. I have so many pairs! And they're so cute! But, hoo boy, do they hurt. Especially the dress shoes. I finally admitted the truth to myself this past Sunday after church: I'm going to have to start buying shoes in 9-1/2. My strappy sandals are just too uncomfortably snug. So it was off to the mall to try on shoes. All of the black shoes were either ridiculously high-heeled, too trendy, or old-ladyish. Where'd the classic black pumps go? I ended up buying some boots to wear with my slacks. Er, trousers. Dress pants? What do you call those things I wear out to dinner that aren't jeans? 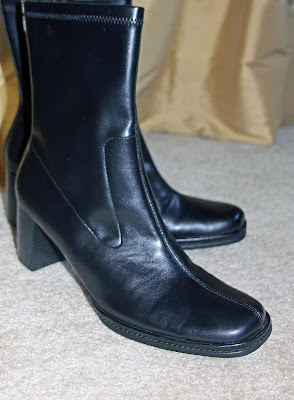 Big, black boots. They're the new strappy sandal. I'm gathering research for a piece that I want to write for possible publication on another site. Of course, by "research" I mean your non-scientific opinions and by "piece," I mean piece of nonsense that noone but myself will probably ever care to read. That said, please delurk and take a minute to participate in the polls that I've posted on the sidebar. Pretty please. There! I'm being all nice and pleading. Help a schlub out, won't you? De-lurk! Click on a couple of polls! They're completely anonymous, so the Man won't be able to track you down and force you to sign up for Obamacare. I promise. Over Labor Day weekend, my eldest daughter went on a camping trip and my husband took our 9-year-old and one of the twins to Grandma's house. So it was just me and my baby. 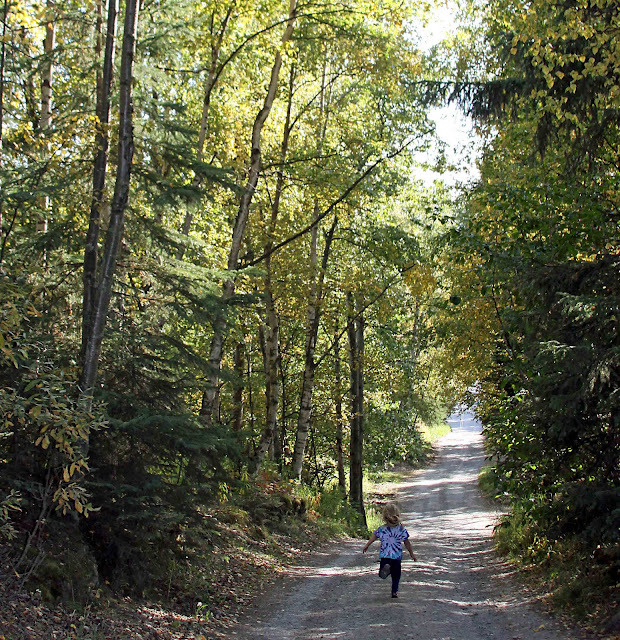 My daughter LOVES to go on walks. She was so happy to have me and Mother Nature all to herself. 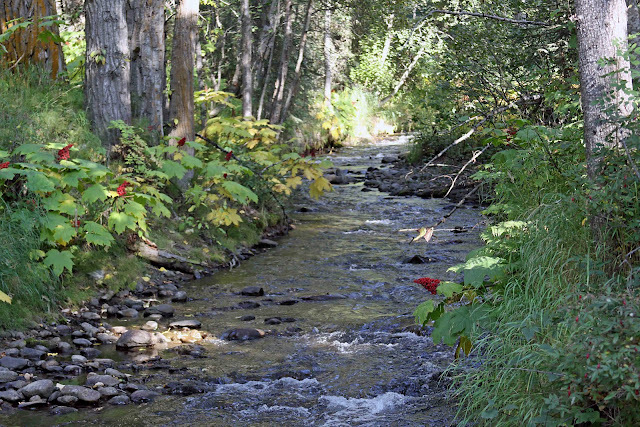 We headed to a nearby creek . . .
. . . where we could throw rocks into the water. I wouldn't let her "pick the pretty flowers," since the last thing I need is her bringing home clover or butter and eggs to invade our lawn and garden. 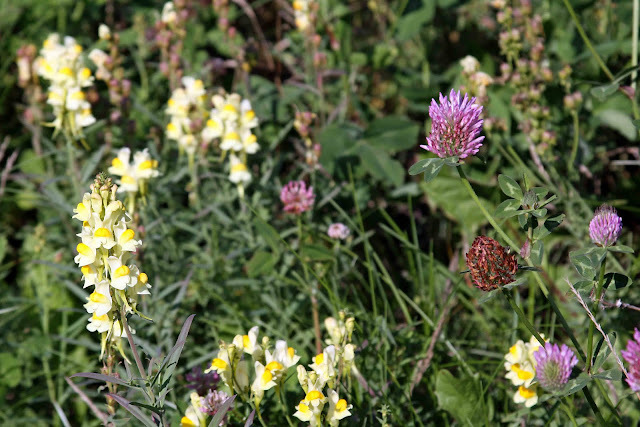 Vile weeds! 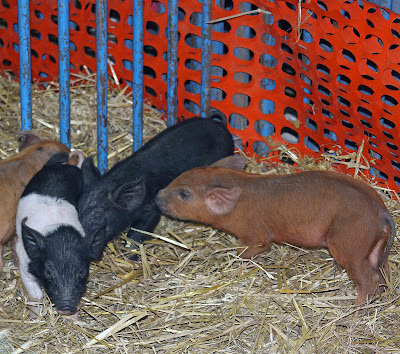 When I think of "state fair," I visualize shiny, plump vegetables and groomed livestock and jars of prize-winning jam. I have to admit that I'm a sucker for the exhibits, but for the past two years—because of certain small children who were too pooped after all the rides—we haven't been able to spend any time strolling through the various buildings that house the many fair entries. This year I vowed that we would go check out the exhibits, and we did. It meant we didn't leave the fair until late in the evening and I was exhausted from all the walking, but here you go . 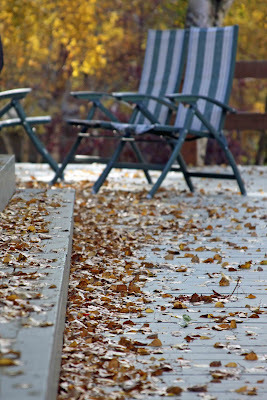 . .
People picture Alaska encased in snow and ice year-round, but we do have a summer season. It's short, but sweet, and our midnight sun allows for some pretty amazing gardens. 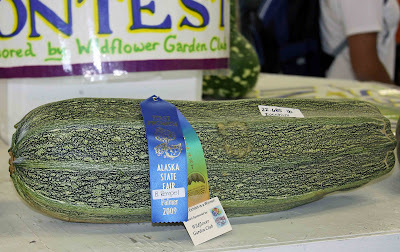 One of the most popular categories at our State Fair centers around the biggest vegetables grown each particular year, and 2009 produced some doozies. 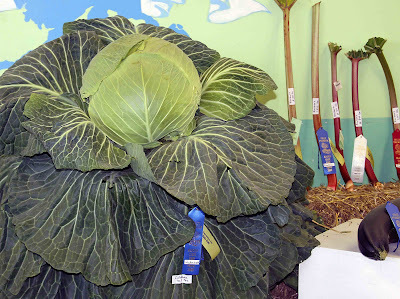 This 90-pound cabbage is nothing, considering that the grand champion weighed over 125 pounds!! In fact, this year's winning cabbage made it into the book of Guinness World Records. That's right, Texas. 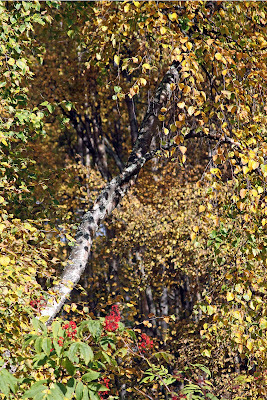 We grow 'em big in Alaska, too. This zucchini tipped the scale at just over 25 pounds. 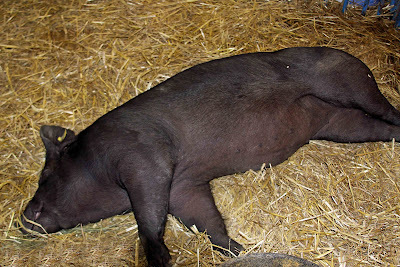 There's nothing cuter than little piglets . . .
. . . and nothing uglier than a big ol' fat lazy mama pig. My absolute favorite exhibit? The quilts! Oh, they're wonderful. This is just one small area. The rest of the quilts hang from the ceiling, and line the walls, and are stacked in piles on tables. 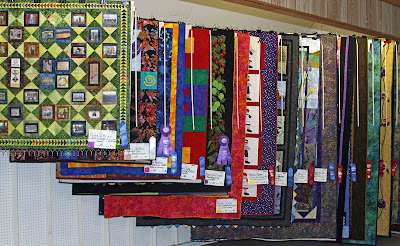 They are so beautiful and represent such creativity and hard work, I could spend all day just looking at the quilts. 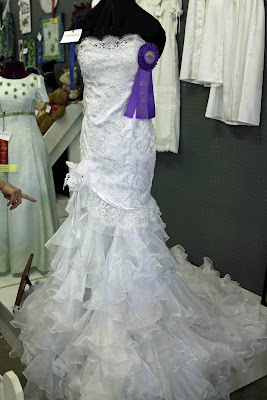 I had to take a picture of this winner in the sewing category. I sewed a couple of dresses this past winter but they sure didn't look like this beauty. Thanks, Captain Obvious, for your hand at the edge of the picture, making sure we notice the spectacular train on this gown. This is one of the peaks on a range that encircles Palmer, where the fairgrounds are located. 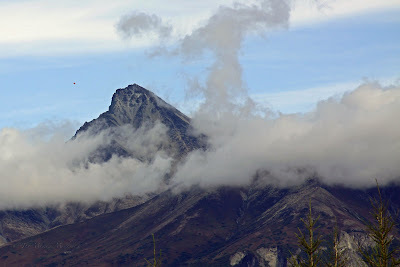 If you put on a pair of magnifying glasses, you just might be able to make out my daughter's red balloon floating away to the left of that mountain. Good-bye, balloon. And good-bye, State Fair. We'll meet again next year: same place, same time. 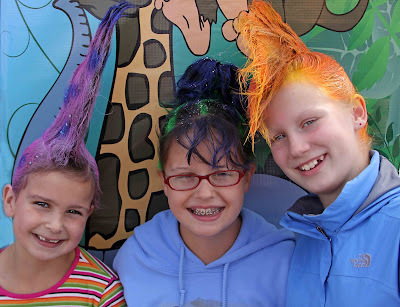 Every year at the fair, I give my older girls the choice of face make-up or crazy hair. This year, they and their friend decided FAIR HAIR, BABY! These hair styles defy every law of gravity and of childhood. They will stay in place despite any silly antic a kid can dream up. 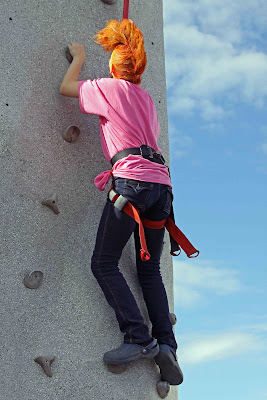 Climbing a rock wall won't faze this fauxhawk. A bucking salmon can't move a single hair on my daughter's head. 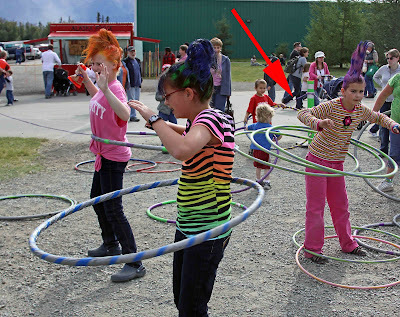 Vigorous hula hooping? Please. My 9-year-old's locks reach for the sky even while she madly twirls 3 hoops simultaneously. Enjoy your day, girls. Your evening bath won't be so fun. 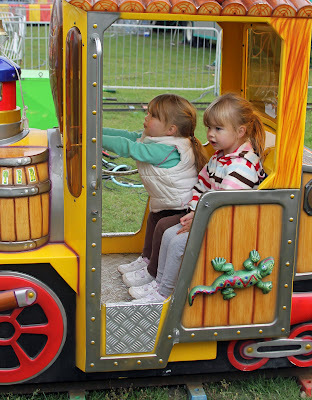 You know you're an old fogey when fair rides no longer elicit screams of delight, but instead cause waves of nausea and the onset of a migraine headache. 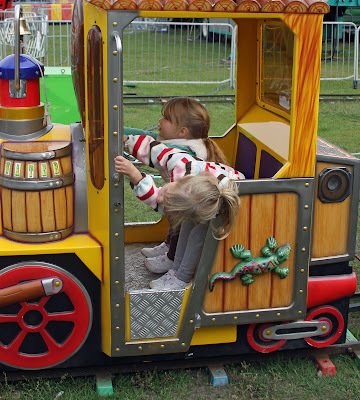 I can't believe I've come to this point in my life, but I'd rather stay on the ground and take pictures of my girls having fun than squeeze my slender hips into a nice, comfy Hell's Bells roller coaster ride and get spun around in circles. I know. I've become my grandmother. Who are these nicely behaved children? inside the railroad car at all times.